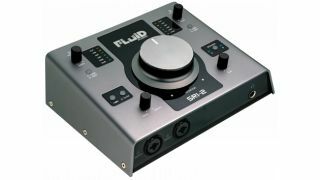 Monitor maestro Fluid Audio has released the SRI-2, a new audio interface that also serves as a monitor switching box. This desktop-based box of tricks sports two XLR/TRS combo inputs with class A mic preamps and +48v phantom power. You can switch between two sets of speaker outputs, and you’ll note the highly-grabbable master volume knob up top. The SRI-2 is shipping now priced at $230/€220. Find out more on the Fluid Audio website.